The bicycle has become a common transportation for moving here and there. 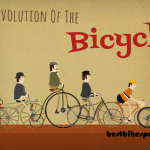 Cycling saves our environment, keeps us healthy and reduces consumption of fuel. As a result, a large number of people are using a bike for moving nowadays. It is no more only a time pass or fun thing; it has become essential for us. We use cycle for going to university or jobs, even in dates too. We need to carry essential things with us. So, at the time of cycling, we need convenient bags that can carry our things as well as stay biking friendly. You will look for some features that will make the bag comfortable and convenient. What are those? I think your answer will be- water resistance, breathability, comfortable padded, lightweight, large space etc. Keeping those in minds, we have got many companies around are manufacturing bags which will be comfortable at the time of cycling. Let’s see the best ones among those bags. Rapha Cycling Backpack is a lightweight backpack mainly manufactured for city road cycling. It is made of water-resistant fabric so that the things you keep inside the backpack remain safe from water. The padded panels of this backpack follow the curve of your body parts. The straps of the bag provide extra stability. There is a housing support for the highly visible pink rain cover which includes reflective Rapha logo to reflect car light.Not only this, the side panels, straps and bases carry some reflective dots which also reflect car light. This backpack includes a laptop compartment, sunglass pocket, outer key compartment. Besides, this backpack is extremely versatile designed with other multiple storage compartments. It also includes expandable 5-liter compartment. Ortlieb Velocity Backpack is a waterproof backpack. It has the foam-padded back which has made this backpack comfortable for carrying. There are some other features which have prepared this backpack as exactly what you want. The shoulder straps of this backpack have made dually padded for giving you extra comfort. Besides, sternum strap and wild waist strap increases stability by ensuring the secure fit. The roll-top system and hook-and-loop closing system ensures easy loading of your accessories inside the main compartment and quick access to that. There are removable inner pockets for keeping smaller items like keys, notebook, mobile phone etc. This backpack is featured with a good ventilation system for comfortable use. The lightweight design has made this backpack something that bikers want. Osprey Redial 26 is a comfortable backpack for cycling with storage space for riding gears. It is an excellent backpack with extra breathability which is ensured by trademarked AirSpeed Suspension. There is a zippered main compartment with many extra small pockets for saving your small accessories. There is an extra padded compartment for keeping your laptop or tablet safe. The shoulder straps include breathable mesh and perforated foam for ensuring user comfort and breathability. Both sides of this backpack are featured with stretch-mesh pockets where you can keep small things. The trademarked LidLock helmet clip secures your helmet. There is some reflective trim on the backpack which has made this backpack visible to other vehicles in low light. In fact, this backpack is manufactured keeping the cyclists in mind. 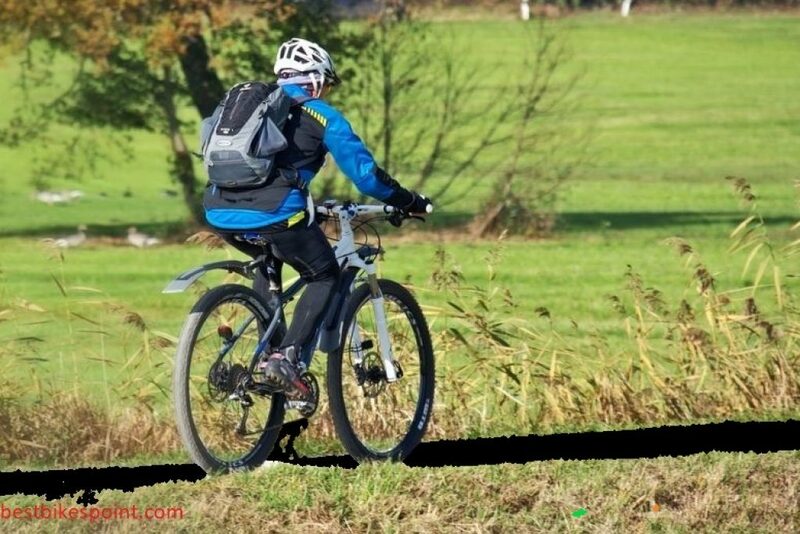 Deuter Bike One 20 liter is a biking friendly backpack which is made keeping cyclists in mind. The Sturdy, ultra-tight weave ripstop nylon is featured with a polyurethane coating to make this backpack durable. The mesh-lined, padded straps of the bag ensured maximum airflow by minimal contact with the back. For on-the-go hydration of the cyclists, this backpack includes BPA-free Streamer Hydration 100 fl. Oz. reservoir. It also includes drink tube with it. For effective transfer of load weights to your hips, the backpack features a Spring Steel Frame design. The interesting feature is the rain cover which can be deployed at a moment’s notice. There is a mesh helmet holder in the backpack. There are some side pockets which allow you to store the water bottle and other small cycling gears. The main compartment has enough space for carrying your daily essential things. Proviz REFLECT360 is a backpack which is designed for being extra comfortable for the users. To identify this at night, it includes millions of integrated reflective beads which are made using reflective materials certified by CE EN 20471. To increase visibility, the backpack contains light loop for adding extra LED light. Adjustable waist strap and adjustable chest straps of this backpack help the user to keep it stable at the time of cycling. Front zip pockets will allow you to store your cards and other smaller things. The mesh side pockets are there for providing you chance to keep your water bottle firmly. The elastic shoulder strap loop can keep accessories. You can easily use a 2-liter hydration pack with the backpack and straw attachment for easy access. The ventilation of the backpack is ensured by the Beetle Ventilation System which keeps air moving freely and reduces the clammy feeling. With keeping visibility, breathability, comfort in mind, this backpack is a complete package for the cyclists. As biking has become an essential part of our life and backpack can be called the storehouse of our daily essential accessories, we need both. A backpack with a cycle will help you a lot to complete your works of a whole day. So comfortable backpack for cycling is more than essential as longtime cycling introduce you to tiredness. The best biking backpack is a combination of comfort, lightweight, and large space. 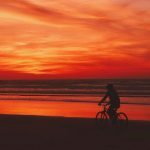 So you have to choose carefully if you want to buy the best biking backpack for you.